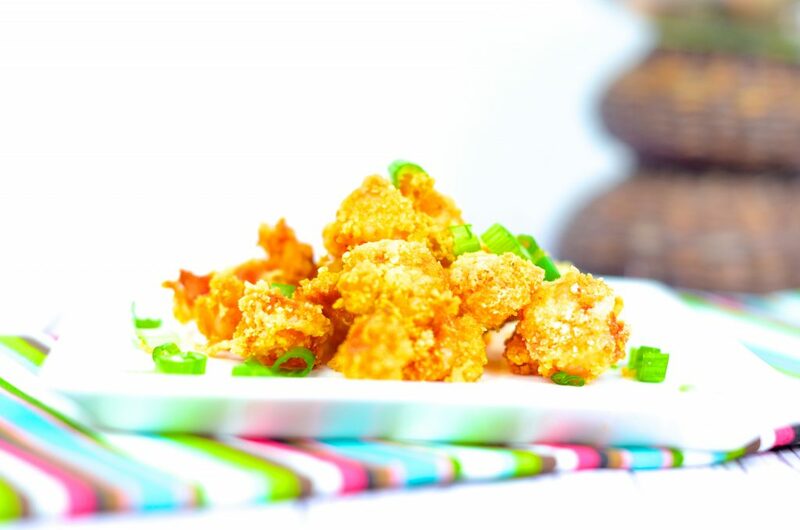 At only 2 NET CARBS per serving, you won’t believe the crisp, crunch, and taste from these air fried crawfish. Question time! What is your favorite fried seafood? With so many amazing Louisiana Seafood, Mississippi Seafood, Alabama Gulf Seafood, and Texas Seafood products available, it is hard to pick a favorite. My wonderful Yankee husband will often say, ‘Fish!’ In my awesome speaking engagements at Drug Emporium and at local organizations, I will hear more often that not ‘fish,’ as the answer. I love fish, I really do, but we have some many other options available. Most of us pick fish since it is readily available throughout the year and throughout the country. My choice however is not fish, I have 2 – crawfish and gator! Mr Skinny Louisiana is from Ohio, and he looks at oysters and alligator meat with a bit of fear in his eyes. I give him serious credit, he will try each seafood I pass on over to him. 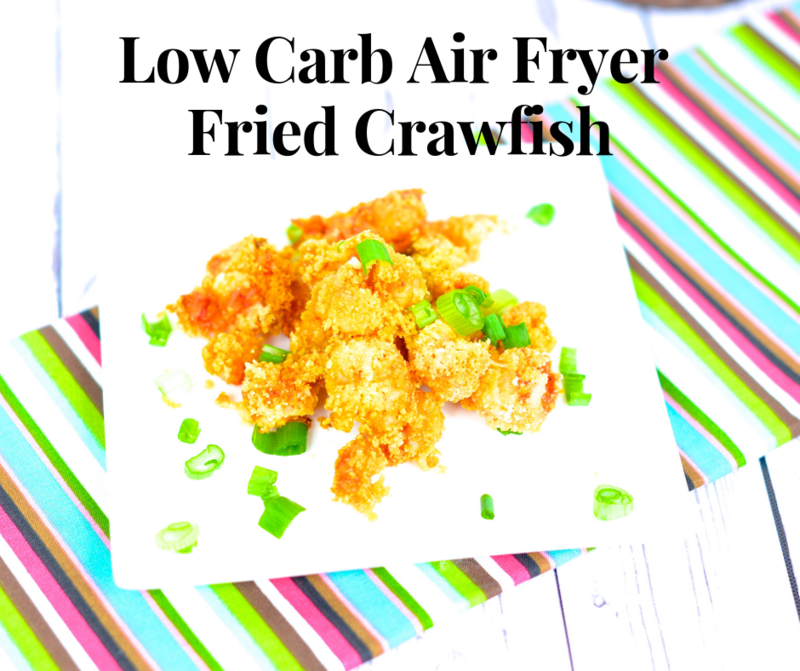 And after learning how to peel crawfish (to read his introduction to crawfish story, you can check out my Low Carb Air Fryer Crawfish Beignets), this nutrition packed seafood is a favorite of his. Along with Greg’s love of crawfish, Christian (my 5 year old) loves crawfish so much, he has a namesake recipe in my first cookbook, Skinny Louisiana…in the Kitchen), Christian’s Crawfish Casserole. While fried fish and shrimp is typically the answer of most when discussing fried seafood, I knew I could have a winner with fried crawfish. This problem? The carbs in the breading. 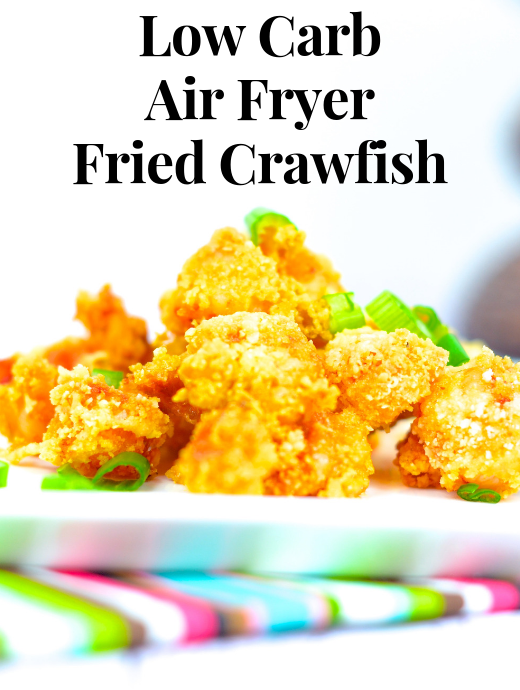 I went to my drawing board to develop a low carb air fryer fried recipe using my Phillips Air Fryer. 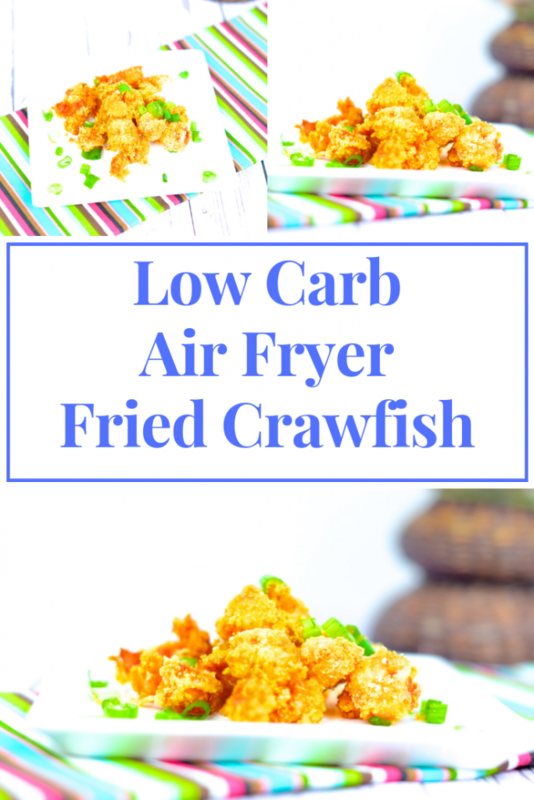 The result is an amazing low carb keto friendly air fryer fried crawfish the entire family will love. I hope you and your family will enjoy it as much as mine does! While many of us recognize crawfish as a protein and not a high carb meat, many question ‘Is this an ok meat?’ Louisiana crawfish is an amazing source of protein with three ounces of crawfish at 0 carbs and 12 grams of protein. 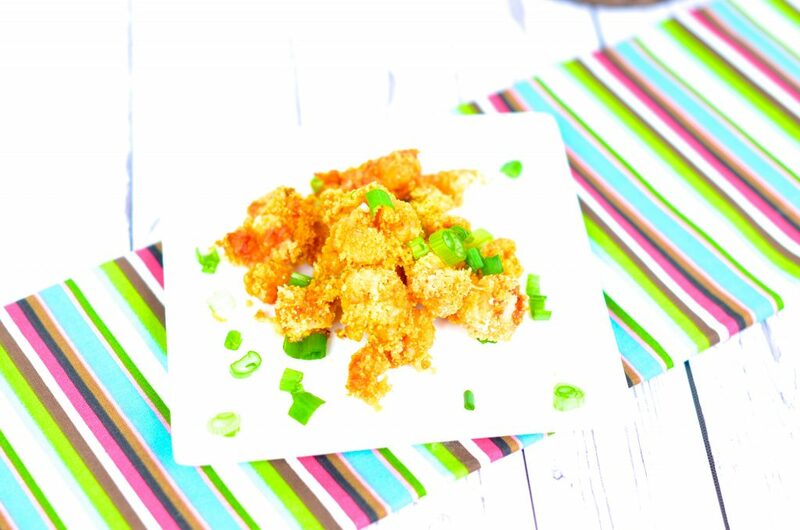 If you are looking to use leftover crawfish in this recipe, be ready to peel 7 pounds to yield the 1 pound of crawfish tails. While it is temping to look in our supermarket freezer section from crawfish tails, make sure the product is Louisiana based and not exported from China. With any fried item, flour is the basic, breading ingredient. It serves several purposes, mainly to ‘bread’ the product. Flour in the low carb and low net carb world makes us cringe since whole wheat flour has 21 grams of carbs and 3 grams of fiber per 1/4 cup serving. Enter almond flour! Almond flour is made of almonds that have been ground to a fine texture. It is a gluten free, keto friendly, grain free food and contains approximately 5-6 grams of carbs per 1/4 cup. Don’t panic over the carbs, almond flour has approximately 3 grams of fiber giving this flour a net carb of 3 per serving. And please don’t panic over the fat. Remember nuts are the fats we want to include in our diet. I do enjoy cooking with almond flour, but I personally feel due to it’s heavier texture, almond flour works best in bars, brownies, and muffins as well as in my batters for my vegetables and meats in the air-fryer. Almond flour makes a great low carb bread crumb when combined with grated Parmesan cheese. Please note, the type of almond flour does matter. Make sure to use super-fine almond flour from balanced almonds. We used Bob’s Mill Almond Flour in this recipe. You can purchase online here! We love eggs in the Skinny Louisiana kitchen. Eggs offer us an amazing source of protein with zero carbs. While my keto friends will ask about using a whole egg, I prefer the egg white in recipes using the Air Fryer. I used 100% percent egg white carton. Make sure in the ingredient list the only ingredient is 100% egg whites. Defrost that delicious Louisiana crawfish. In one bowl, pour egg whites. In a separate bowl, combine almond flour, Tony Chachere’s lite, garlic powder, and grated parmesan cheese. Using a spatula combine mixture until all ingredients are mixed. Grab your non-stick cooking spray. Spray Air Fryer basket with non-stick cooking spray. Using tongs, dip crawfish in egg white, then flour mixture. Line Air Fryer basket with breaded crawfish. Spray basket with non-stick cooking spray (yes, over the breaded crawfish) and close basket. Set temperature at 330 degrees. Cook 4 minutes. At end of 4 minutes, check level of doneness. Depending on your desire of crispness, you can cook for an additional 3-5 minutes. In a small bowl, pour egg whites. Place aside. In a medium sized bowl, combine almond flour, Tony Chachere’s lite, garlic powder, and grated parmesan cheese. Using a spatula combine mixture until all ingredients are mixed. Spray basket (containing breaded crawfish) with non-stick cooking spray. Close basket. Set temperature at 330 degrees. Cook 4 minutes. At end of 4 minutes, check level of doneness. Depending on your desire of crispness, you can cook for an additional 3-5 minutes. Calories: 170, Total fat: 8g. Saturated fat: 1.5g, Cholestertol: 105mg, Sodium: 310mg, Total carbs: 3g, Fiber: 1g, Protein: 21g.